Signed by the artist, lower right, in pen and black ink, "L. DAVID"
Label: Inscirbed on label adhered to old backing, in pen and grey ink, "André Antoine Bernard né le 21 juin 1751 à l'assemblée législative le 29 août 1791, à la Convention Nationale le 14 7bre 1792. Mort à Funehal, île Madere en 1818. Enfermé a la prison des quatre nations du 28 mai 1795 au 26 octobre. Le peintre David détenu avec lui fit ce portrait"
Secondary Inscription: Inscribed around the perimeter of the old backing, in pen and brown ink, "Bernard, de Saintes, représentant du peuple francais à la Convention Nationale, peint par son collègue David avec de l'encre de la chine, dans la Maison d'arrête des quatre Nations à Paris, le 6 Thermidor an 3 de la republique", "14" Inscribed in graphite, on the old backing, "no 3 bis". During the French Revolution, Jacques-Louis David was imprisoned twice for his support of Robespierre and for signing arrest warrants while serving as a member of the Committee for Public Safety. 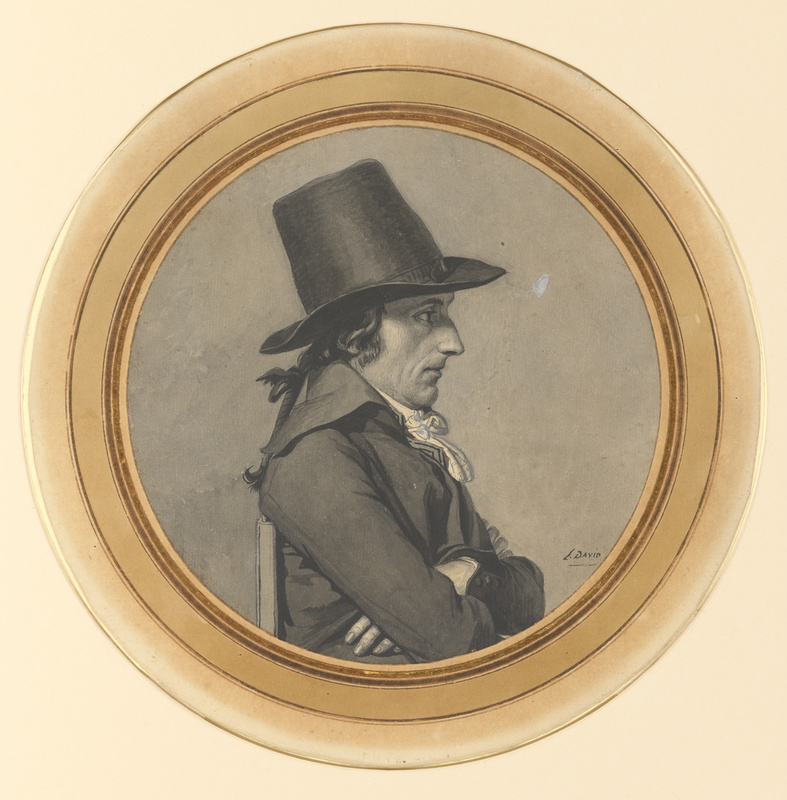 While in prison, David made numerous portrait drawings of fellow prisoners, one of which is this drawing of André-Antoine Bernard, known as Bernard des Saintes, a lawyer who was eventually exiled for voting to execute Louis XVI. The portrait conveys the intensity of his subject's political beliefs. Bernard, who was forty-four at the time, poses stiffly in a high-backed chair with his arms folded resolutely across his chest. David captured the lawyer's forceful character in the determined set of his mouth, his fixed gaze, and his strong profile. Hazlitt, Gooden & Fox, Ltd.